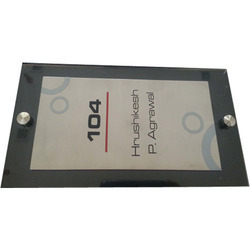 Pioneers in the industry, we offer ss name plate, ss name plates, brushed steel nameplate, stainless steel nameplates, bungalow name plate and door nameplate from India. 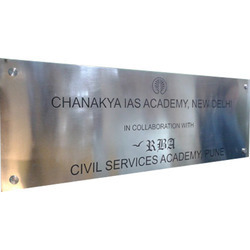 We are the preferred manufacturer, supplier and exporter of SS Name Plate which is manufactured from fine quality stainless steel under the supervision of our professionals. Widely appreciated for their elegant designs, varied range of sober letter styles and border styles, these address plates are hugely demanded. The offered range of name plates is also appreciated for easy fixation, corrosion resistance and smooth finishing. We produce the finest quality of SS Name Plates and labels which are the toughest & durable material and has applications wherever severe conditions are to be sustained. This property of SS makes it a popular Signage material and is very widely used in the industry. The process of making signage in SS involves Chemical etching of the material and then providing required finishes such as Mirror Buffed, Matt, Brush finish etc. The Etched images are filled with durable Automotive or Epoxy Paints for the everlasting effect. Again the durability and withstand level to harshest condition is the key of our product. Brushed Steel Nameplate offers a professional, customized look to any office or interior. 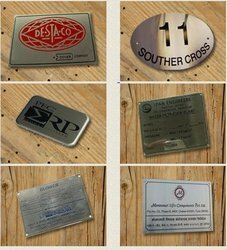 Manufactured from quality stainless steel, offered nameplates are made available in different sizes and shapes so as to cater to the diverse needs of our clients. 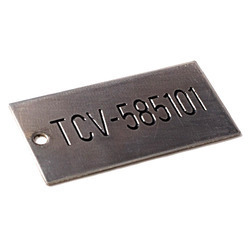 These easy-to-clean nameplates are appreciated for their simplicity, corrosion resistance and durability. We offer brushed steel nameplates at industry leading rates to our clients. We produce the finest quality of Stainless Steel Nameplates and labels which are the toughest & durable material and has applications wherever severe conditions are to be sustained. This property of SS makes it a popular Signage material and is very widely used in the industry. The process of making signage in SS involves Chemical etching of the material and then providing required finishes such as Mirror Buffed, Matt, Brush finish etc. The Etched images are filled with durable Automotive or Epoxy Paints for the everlasting effect. Again the durability and withstand level to harshest condition is the key of our product. We bring forth this Bungalow Name Plate, which is available in stylish and classic designs to go with your decor. Made up of quality grade stainless steel, these nameplates offer supreme finish and luxurious look. We use an extensive selection of letter styles, border styles and background textures to meet the varied requirements of our customers. Clients can avail these elegant nameplates at affordable rates. 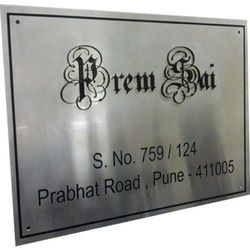 We offer superior quality Door Nameplate made from stainless steel in different eye catching designs. Made available in different styles of letters and borders, these door nameplates offer a unique mark of identification to your place. 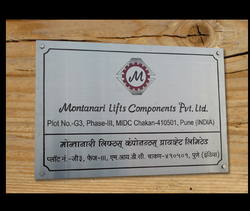 These nameplates are widely appreciated for their stylish looks, corrosion resistance property and high durability. 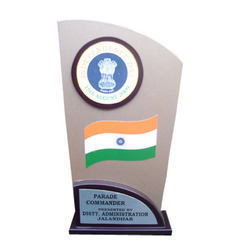 We manufacture, supply and export supreme quality Gloss Finish Nameplate made from stainless steel under the extreme supervision of our professionals. Made available in various sizes and styles, these nameplates are offered in high and low gloss finish to suit your different requirement. Ideal to be used in offices and residences, these nameplates are made available at market leading rates. We are engaged in offering Momento Plate manufactured from stainless steel in artistic designs. Presented in different shapes and dimensions, these momento plates find application for purposes involving recognition, promotion, or celebration. 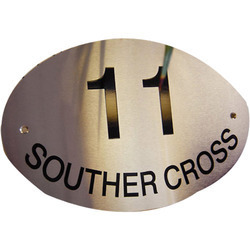 We offer these plates in a diverse range of letter styles, border styles and finishes. Our clients can avail these durable, elegantly designed and corrosion resistant plates at reasonable prices. 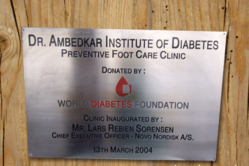 We bring forth Stainless Etched Filled Nameplate which is made available in different sizes and shapes to fulfill the diverse requirements of our valuable clients. These nameplates are etched on stainless steel and then filled with multicolored baked enamels and epoxies. Majorly used in homes and offices, these nameplates offer clean etching with sharp detailing and impeccable brushing. Looking for Stainless Steel Nameplates ?